You may have read that the best way to get started in investing is to buy index funds. But if you're new to investing, you may wonder why? I'll explain why some people think index funds are special and how to invest in them if you think so too. Index funds contain stocks that are part of a market index, such as the S&P 500. A passively managed index fund (typically known simply as an index fund) seeks to duplicate stocks held in the index and, therefore, the market performance of the index. So, by owning a market index fund, you can invest — without having to spend the time or effort choosing when to buy and sell individual stocks. There are many market indexes. When people talk about index funds, they are often referring to a mutual fund or exchange-traded fund (ETF) that tracks the S&P 500. But there are many indexes, which represent stocks in many different categories. You can see some big lists at Bloomberg's World Stock Indexes and Russell Investment's Russell Indexes. For example, you'll find the Dow Jones Industrial Average that contains 30 major companies and the Russell 2000 that represents comparatively smaller companies. There's also the FTSE 100 Index that contains the 100 largest capitalized companies traded on the London Exchange and the Nikkei 225, which covers 225 of the biggest businesses in Japan. There are also bond indexes, such as the Barclay Global Aggregate. Index funds contain stocks or bonds in their respective market indexes and should track these indexes. Generally, index funds contain the stocks or bonds in their respective market indexes. Index funds are said to “track” the index. That is, the fund performance tends to move in the same direction as the index in terms of growth (or decline). A common way for funds to track an index is to replicate the index precisely. Generally, the fund contains a proportional percentage of stock holdings as similar to the actual index as possible. However the funds may employ other methods of tracking; for example, they may contain the same stocks but in different proportions. Or fund managers may decide to hold a limited number of stocks that should mimic index performance. The performance of your index fund should be similar to that of the index, but will vary. The index represents the accumulated growth of all stocks (or bonds) combined. But an index fund incurs expenses, such as commissions on the buying and selling of stocks when the composition of the index changes, along with administrative and management fees. These expenses detract from overall returns. In addition, the stocks in the index fund may not be exactly the same as those in the index. Index funds should have low costs. Index funds are passively managed, meaning that fund managers aren't actively involved in the day-to-day selection, evaluation, and trading of stocks. Consequently, such funds typically have fewer expenses than actively managed funds and these cost-savings are (or should be) passed along to the investor. When you are looking for an index fund to buy, make sure costs are low. For example, iShares Core S&P 500 ETF (IVV) has an expense ratio of .07%; Schwab S&P 500 Index (SWPPX), .09%; and Dreyfus Basic S&P 500 Stock Index (DSPIX), .21%. All of these are well below most actively managed fund expenses. Investing in index funds allows you to invest inexpensively and earn market (index) returns; however, gains are not guaranteed. I agree with experts who say that index funds are an easy, inexpensive way to invest, whether you are a newbie with a few hundred dollars or an experienced pro with tens of thousands to invest. And I concur that your risk is spread out (generally over large parts of the U.S. economy, European economy, etc.). However, just because you are investing in many stocks (say 500, 1000, or more) doesn't mean that you don't have investment risk. Investing is risky, period. The value of your investments can decline, if the economy as a whole (or its stock prices) decline. So, the purpose of index investing is to mimic market performance and economic growth, not to guarantee positive returns year after year. When the market grows, your investments grow; but when it stagnates or declines so do your investments. You can find index funds at your favorite online brokerage firm. Most online brokerage firms have index funds available for your purchase. To search for an index fund at your online brokerage firm, go to the mutual fund or ETF screening tool. You may be able to easily apply a filter to find index funds. But if not, look for the commission-free ETFs or no-transaction-fee, no-load mutual fees with low expense ratios; these are likely to be index funds. Some may have redemption charges as high as $49.99 for funds that you buy and sell in a short time period. So, if you decide to invest in index funds (or nearly any fund for that matter), consider investing for the long term to avoid these expenses or avoid funds with redemption fees. 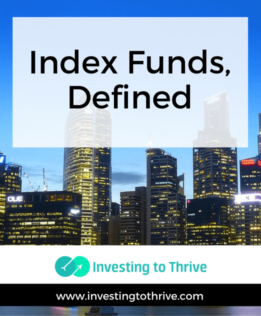 To learn more about an index fund, including what index the fund tracks and how closely it tracks the index, read more about them on their profile pages and/or prospectuses. Note that index funds reference mutual funds but exchange-traded funds (ETFs) may also follow indexes. However, not all mutual funds (or ETFs) are index funds; some contain a narrow assortment of hand-picked stocks instead of a broad representation of stocks and/or bonds from domestic or international sources. To invest in an index fund, open an account with an online brokerage firm such as E*Trade, Fidelity, Schwab, or TD Ameritrade. Fund your account by establishing a connection with your bank to facilitate ACH transfers. Find an index fund to your liking and purchase shares, either a one-time purchase or monthly contributions. After you invest, consider monitoring the fund and its performance occasionally as fund manager's investment practices and indexes may change over time. The idea of passive investing means that you shouldn't have to monitor every move … you ought to be able to relax and spend your time on other activities besides investing.